The M81 group is another famous group of galaxies mainly because it contains the famous M81/M82 pair of galaxies discovered in 1784. 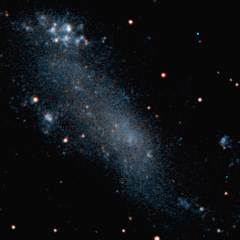 NGC 2403 is another prominant spiral galaxy on the right side of the group. 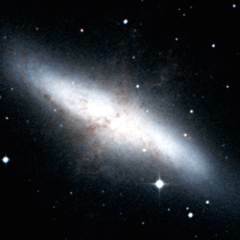 M82 is a famous example of a starburst galaxy - there is a lot of star formation occuring in this galaxy. Below - three galaxies in the right side of the M81 group. 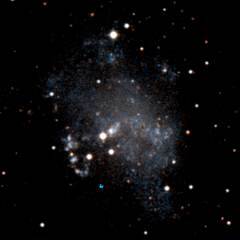 NGC 2366 (left) is an irregular galaxy where a lot of recent star formation has occured. The brightest part of this galaxy is known as NGC 2363 - it is a huge HII region (emission nebula) where a lot of bright blue stars have formed. NGC 2403 (centre) is the second largest galaxy in the M81 group. 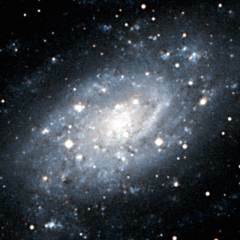 Holmberg II (right) is one of nine low-surface-brightness galaxies listed by Erik Holmberg in the 1950's, three of which are associated with the M81 group. This is a list of the main galaxies in the M81 group. The three main galaxies in this group are M81, NGC 2403 and NGC 4236. UGC 3794     07 22.9  +77 48   17.8  SBm    1.0    5    ? UGCA 220     10 49.3  +64 43   16.9  Irr    1.7    5    ? Column 1: The usual name of the galaxy. Column 2: The Right Ascension for epoch 2000. Column 3: The Declination for epoch 2000. Column 4: The blue apparent magnitude of the galaxy. 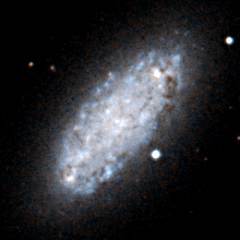 Column 6: The angular diameter of the galaxy (arcminutes). Column 7: The diameter of the galaxy (thousands of light years). Column 9: Other names of the galaxy. distances, kinematics and structure. Astron and Astrophys, 383, 125. Schmidt K, Priebe A, Boller T, (1993), Nearby Galaxies. 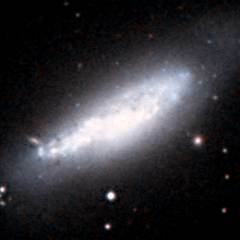 Astron Nachr, 314, 371. Below - three more M81 group galaxies. M82 (left) is a very famous example of a starburst galaxy - it contains a lot of young, bright stars probably because a close encounter with its more massive neighbour M81 has triggered a lot of new star formation. IC 2574 (centre) by contrast is a much dimmer galaxy even though it is approximately the same size as M82. NGC 4236 (right) is a large galaxy in the left side of the M81 group. 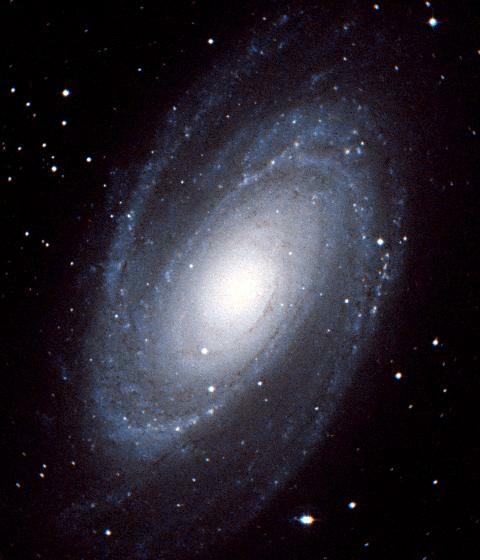 Shown below is M81. 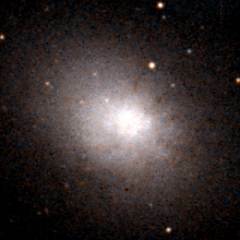 This galaxy is the dominant galaxy in the group and it is similar in size to the Milky Way. This galaxy is one of the brightest galaxies in the sky, and although it is too faint to see with the naked eye, it is an easy galaxy to find with binoculars if you know where to look. Below - three bright dwarf galaxies in the M81 group. NGC 2976 (left) is a small spiral galaxy approximately two million light years behind M81. 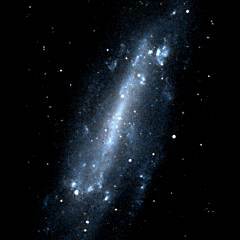 NGC 3077 (centre) is much closer to M81 - they are separated by about 140 thousand light years. 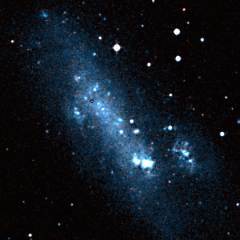 NGC 4605 (right) is a small spiral galaxy on the left edge of the group.